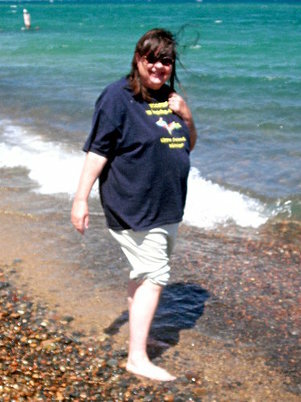 Photo of me with my feet in Lake Superior at Whitefish Point in the UP. My name is Diane Wallace, also known here as Grannysage. I grew up in the Upper Peninsula of Michigan and this is a picture of me taken in 2012 when we made a trip there in our RV. I was very happy to be able to put my feet in Lake Superior after a long time of being away from my roots. I have been writing on-line for six years, on various websites. Before that I had a weekly column in a hometown newspaper when my children were little. For many years I didn't write at all, but have now re-discovered my passion. What I have included on this page are links to various articles that I have written that tell a lot of my story. You will also find things about me as you discover other links throughout this website. I started Crossroads to present my work to the world in a creative fashion. If you feel drawn to the stories, or one of them speaks to you strongly, don't hesitate to follow the link to the Notes from the Crossroads blog to leave a comment. Just a simple summary of the main points of my life. The tale of my journey of life and how I became a hermit. Header image is the Copper Harbor lighthouse, taken by my husband.